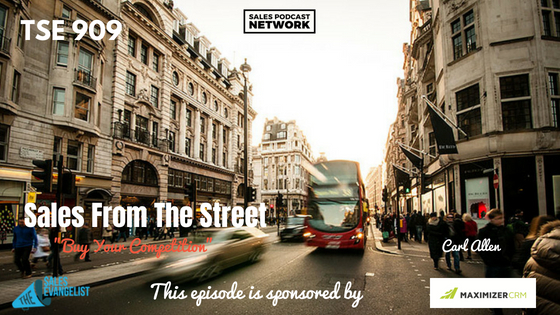 TSE 909: Sales From The Street:"Buy Your Competition"
There’s a difference between having a lifestyle business and having a business that’s truly scaling and growing. In order to grow, you have to have customers. The secret is to buy your competition. 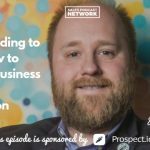 On today’s episode of Sales From the Street, Carl Allen talks about how to massively grow your sales by acquiring another business. He’ll explain why he believes the key to overcoming your challenges might be to buy your competition. 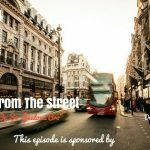 If you’re new to the podcast, our Sales From the Street episodes feature stories of people who have faced challenges and overcome them. Carl decided he was tired of working for other people and he wanted to do his own thing. He only had one skill set, which was to buy and sell businesses, so he decided to do it using other people’s money. Carl has been selling businesses for more than 25 years. When he got the call during an overseas trip saying that his pregnant wife was in the hospital, he had to jump on a plane to get back home. In the moments after his son was born, he realized that he needed to do something else. Carl decided that, instead of doing it in a corporate setting, he wanted to buy and sell his own small businesses. He knew that his tools and experience could be applied to small businesses. He found that lots of people were asking him to coach and mentor them and teach them how to buy and sell businesses, so he built a global system to teach entrepreneurs how to do it. Carl teaches entrepreneurs who work for other people as well as those who want to own their own businesses. He teaches them to find deals, negotiate them, and to do it all without investing their own money. He also teaches small business owners how to double their sales by buying competing businesses or complementary businesses. It’s getting harder and harder to organically grow sales because of the tremendous amount of competition. Carl advises small business owners to stop chasing customers and trying to sell them more stuff. Instead, consider buying a competitor or someone in your supply chain that has some synergy and that can double or triple your sales. The first business Carl bought was generating about $2 million a year, and his competitor was doing $2 million a year as well. They had a conversation, and Carl acquired the business, literally doubling his sales overnight. Organically, the same growth would have likely taken about 10 years. Sometimes, instead of buying a competitor, you can buy a business in a complementary sector and cross-sell. Carl, for example, owns a software company, and he’s about to acquire an IT company to sit alongside it. He’ll sell software to the IT services customers, and sell IT services to his software customers. When the businesses combine, there will be opportunities for cost consolidation and synergy between the two. He calls it the 1 + 1 = 3 model. In the end, he’ll have software revenues, services revenues, and the two together. When Carl started in 2008, Facebook wasn’t prevalent and people weren’t marketing on LinkedIn. Growing his business would have included local advertising, trade show events, and good old-fashioned cold calling, referrals, and networking. There’s a huge myth about acquisition and it’s this: if a business is worth a $1 million, you must have $1 million to acquire it. The truth is that you can buy a small business without spending your own money. The big private equity guys on Wall Street do it all the time. Carl applies those same principles and tactics. If you’ve never bought a business before, there’s clearly a learning process, which is why Carl built his academy. In his dealings, 99 out of 100 business owners don’t know how the process works. He built his academy to empower business owners to scale their businesses differently. When you decide that you’re interested in acquiring a business, the best way to start is by approaching your competitors with a cleverly written letter which builds rapport, trust, and credibility. Most likely, someone in my network will know you or will know someone who knows you, and I’ll get to you that way. The key is in the psychology. You’re looking for the distressed owner whose business is stable. You need a seller with a strong motivation to come out of the business. They might be ready to retire, or they might be bored, or they might be sick, or they might have run out of ideas. In fact, the biggest pocket of opportunity in North America right now is retiring baby boomers. The Wall Street Journal published last year that 10,000 baby boomers retire every day, and 19 of those own a small business. Previously, one of their children might have taken over the business, but those tendencies have changed massively. Their kids want to go to college now, and they don’t want to take over the family business. These boomers don’t have an exit strategy. Only 1 in 13 small business that tried to sell actually do. If you have good business history, and good employees, and good customers, then you don’t want to close the business. You’ve got to understand why the business owner wants to sell. Ultimately, it’s the best way to understand the pain they are feeling right now. You’ve also got to find out how they do their marketing. Very often, we find that they aren’t even marketing. They are relying on word-of-mouth. That means when I do employ marketing, we’re going to see growth. We’re solving that problem with the leveraged buyout model. You might ask yourself why a business owner would allow you to buy the business without spending your own money. In many cases, it’s their only option. They either sell to you, or they turn out the lights, close the doors, walk away, and let everyone down. Instead, a safe, trusted pair of hands take the business to the next level and give it a new lease on life. The first step for anyone interested in this model is to check out Carl’s 90-minute training webinar. He has a proprietary 10-step model that he has honed over 25 years, and he has created a sort of masterclass training for people who are interested in the model. If you’re an entrepreneur and your dream is to start a business, don’t. Don’t start a brand new business, because 99 percent of them fail. Instead, buy an existing business that’s already doing what you’re looking to do, and use the company’s own resources in cash to acquire it. If you’re an existing business owner and you’re struggling to grow your business organically and your marketing isn’t working effectively, scale your business by acquiring a complementary business. Buying businesses solves everyone’s problems, and it’s a buyer’s market. Connect with Carl at Facebook.com/ninjaacquisitions, and find his evergreen, automated training, at www.ninjaacquisitions.com/free. It’s a webinar-style training with lots of tools and downloads users can access. Today’s episode is brought to you by Maximizer CRM, a personalized CRM that gives you the confidence to improve your business and increase profits. It’s powerful and intuitive. Get rid of the boring CRMs and customize to your team’s selling abilities. Click on the link to get a free demo of what Maximizer CRM can do for you.